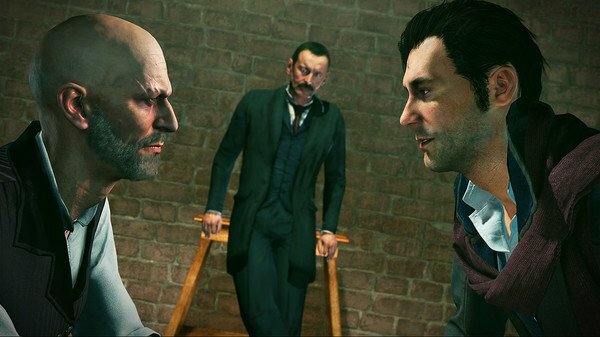 The base gameplay of Sherlock Holmes: The Devil’s Daughter allows you to pick the brains of the great detective while testing your deductive skills. It’s just a shame that long loading times and grating puzzles constantly interrupt any intrigue found within the vague stories. For the most part, you’ll be in control of Mr Holmes in what is essentially a point-and-click adventure within a 3D environment. There are 5 cases to solve, that all include moments teasing the titular title, up until the final mystery. Each story works in the same way; you’re given a case, visit locations relevant to the crime, then logically piece everything together to discover the truth. 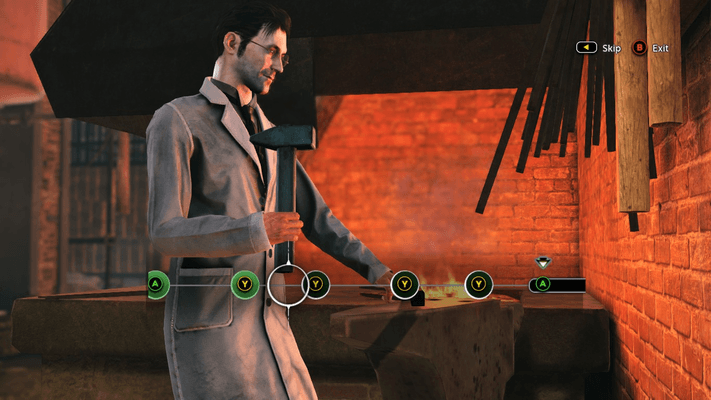 The important question is does the game manages to capture the feeling of being Sherlock Holmes? Well, kind of. The positive elements come in the form of Sherlock-esque mechanics, such as closely analyzing characters to form a profile of them. There’s also a way to switch to a black and white view where details “most people would miss” appear in yellow, and another button that allows you to visualize what may have happened in the past or occur in the future, due to specific chains of events. They’re appealing ways of showing off Sherlock’s skills without getting in the player’s way, and capture how the great detective may view the world. The other successful element, is that The Devil’s Daughter pulls you into its world. My favourite areas were definitely the ones involving the streets of London, as I felt immersed with the locals and could almost smell that grubby air. In a similar fashion, the character’s all had a rough dirtiness to them, matching the times. They’re not the best designs ever, but other than the odd one, it was easy to get into the style. What really pushed things forward though was the voice acting. It added a much needed life to the personalities, which would have mostly fallen flat without the extra colour. Things start to droop a bit when it comes to the stories, though. They hooked me in quite quickly at the start of a case, but petered out just as fast. A certain amount of curiosity would stay throughout the plotlines, but there was never that tingle of excitement over piecing clues together, or any real tension from the situations. Much of this was the fault of a lack of detail or suspense in the storytelling, but a lot was due to the intrusive puzzles and long loading times. I have no aversion to a Sherlock Holmes game having the odd puzzle or two. The problem is that most of them had little to do with solving crime, and were instead shoved in to make The Devil’s Daughter feel more like a ‘game.’ The best example is a segment near the beginning of the first quest where you have to tail someone. Not only do you have the joy of constantly hiding behind cover, but must also perform mini-games in the form of cleaning a chimney, balancing on ledges and shining shoes. To be fair, there were moments when the puzzles did make me feel like Sherlock Holmes, such as analyzing blood samples or solving riddles, but they were unfortunately very few and far between. For me, the loading times were The Devil’s Daughter’s most frustrating feature. Please note that I was playing the PC version on a mid-high end laptop, so other systems and console versions may fair better. For me though, I found the average loading time to be around 3 minutes, which was pretty bad considering it had to load every time I changed location. To give an idea of how much it affected things, the normal playtime is around 8 hours, but mine clocked in at 20. It did improve however once I discovered the ability to change the loading screen from watching Sherlock inside his carriage to a standard picture, so I’d suggest a trip to the option screen as soon as possible. If you manage to get through The Devil’s Daughter’s negatives, you’ll grab all the clues in a case and piece them together to come up with a name for who committed the crime. To keep things interesting, there is normally more than one possible culprit that can be accused, dependent on how you interpret each character’s actions. So if you think a suspect holds a grudge against others, this will probably point fingers in their direction. But if you also believe that they don’t possess the talent to set-up the crime, you may need to rethink your answer so everything fits neatly together. There are two different endings for whoever you decide did the deed, one for sending them to prison, and the other for understanding their motives and forgiving them. While it’s satisfying to see your own personal justice dealt out, the multiple endings make for some rather ambiguous conclusions. I was left disappointed by the amount of endings that ignored clues, glossed over character motivations, and failed to give a solid ‘how it was all done’ sequence. The final insult is the ability to replay your choice after the case, on a screen that also says whether you accused the right person. It rather takes away from the freedom of making your own deductions. 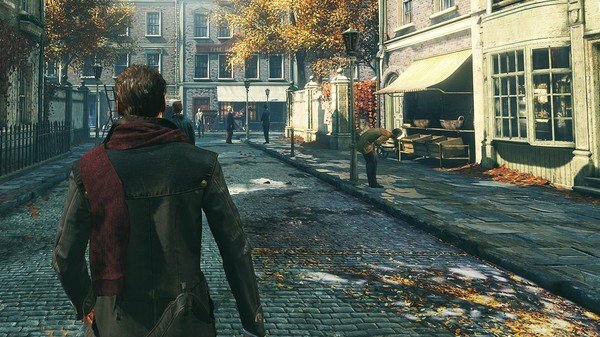 With so many Sherlock Holmes titles under their belt already, you’d have thought that Frogwares would had gotten the formula down to a fine art by now. In reality though, Sherlock Holmes: The Devil’s Daughter misses the mark, with loading times and puzzles constantly dragging away from the plot. Moments where the mechanics get it right can provide a rush of smugness comparable to Sherlock’s character, but it was never enough to save the vague solutions, or make the journey to reach them rewarding.